There are two kinds of people who violate the rules of statistical inference: people who don't know them and people who don't agree with them. I'm the second kind. The interpretation of p-values: Suppose you are testing a hypothesis, H, so you've defined a null hypothesis, H0, and computed a p-value, which is the likelihood of an observed effect under H0. According to the conventional wisdom of statistics, if the p-value is small, you are allowed to reject the null hypothesis and declare that the observed effect is "statistically significant". But you are not allowed to say anything about H, not even that it is more likely in light of the data. I disagree. If we were really not allowed to say anything about H, significance testing would be completely useless, but in fact it is only mostly useless. As I explained in this previous article, a small p-value indicates that the observed data are unlikely under the null hypothesis. Assuming that they are more likely under H (which is almost always the case), you can conclude that the data are evidence in favor of H and against H0. Or, equivalently, that the probability of H, after seeing the data, is higher than it was before. And it is reasonable to conclude that the apparent effect is probably not due to random sampling, but might have explanations other than H.
Correlation does not imply causation: If this slogan is meant as a reminder that correlation does not always imply causation, that's fine. But based on responses to some of my previous work, many people take it to mean that correlation provides no evidence in favor of causation, ever. I disagree. As I explained in this previous article, correlation between A and B is evidence of some causal relationship between A and B, because you are more likely to observe correlation if there is a causal relationship than if there isn't. The problem with using correlation for to infer causation is that it does not distinguish among three possible relationships: A might cause B, B might cause A, or any number of other factors, C, might cause both A and B. So if you want to show that A causes B, you have to supplement correlation with other arguments that distinguish among possible relationships. Nevertheless, correlation is evidence of causation. I disagree. It think regression provides evidence in favor of causation for the same reason correlation does, but in addition, it can distinguish among different explanations for correlation. Specifically, if you think that a third factor, C, might cause both A and B, you can try adding a variable that measures C as an independent variable. If the apparent relationship between A and B is substantially weaker after the addition of C, or if it changes sign, that's evidence that C is a confounding variable. Conversely, if you add control variables that measure all the plausible confounders you can think of, and the apparent relationship between A and B survives each challenge substantially unscathed, that outcome should increase your confidence that either A causes B or B causes A, and decrease your confidence that confounding factors explain the relationship. By providing evidence against confounding factors, regression provides evidence in favor of causation, but it is not clear whether it can distinguish between "A causes B" and "B causes A". The received wisdom of statistics says no, of course, but at this point I hope you understand why I am not inclined to accept it. Methods for causal inference, like matching estimators, have a special ability to infer causality: In this previous article, I explored a propensity score matching estimator, which is one of the methods some people think have special ability to provide evidence for causation. In response to my previous work, several people suggested that I try these methods instead of regression. Causal inference, and the counterfactual framework it is based on, is interesting stuff, and I look forward to learning more about it. And matching estimators may well squeeze stronger evidence from the same data, compared to regression. But so far I am not convinced that they have any special power to provide evidence for causation. Matching estimators and regression are based on many of the same assumptions and vulnerable to some of the same objections. I believe (tentatively for now) that if either of them can provide evidence for causation, both can. As these examples show, many of the rules of statistics are oversimplified, misleading, or wrong. That's why, in many of my explorations, I do things experts say you are not supposed to do. Sometimes I'm right and the rule is wrong, and I write about it here. Sometimes I'm wrong and the rule is right; in that case I learn something and I try to explain it here. In the worst case, I waste time rediscovering something everyone already "knew". If you think I am doing something wrong, I'd be interested to hear why. Since my goal is to test whether the rules are valid, repeating them is not likely to persuade me. But if you explain why you think the rules are right, I am happy to listen. 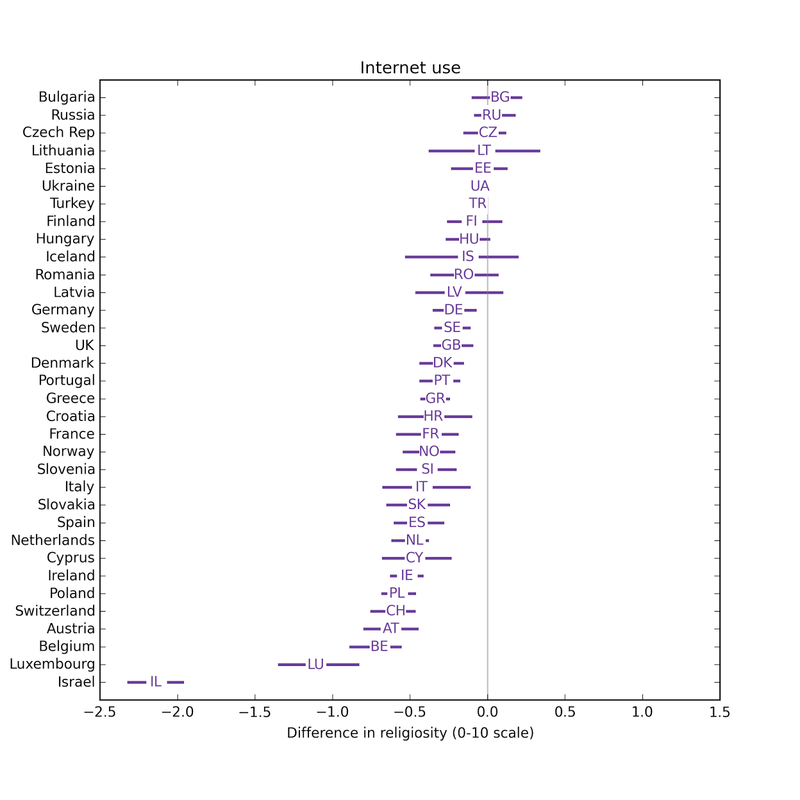 In my work on Internet use and religion, one of the recurring questions is whether the analysis I am doing, primarily regression models using observational data, provides evidence that Internet use causes decreased religiosity, or only shows a statistical association between them. I discuss this question in the next section, which is probably too long. If you get bored, you can skip to the following section, which presents a different method for estimating effect size, a "propensity score matching estimator", and compares the results to the regression models. Internet use predicts religiosity fairly strongly: the effect size is stronger than education, income, and use of other media (but not as strong as age). Controlling for the same variables, religiosity predicts Internet use only weakly: the effect is weaker than age, date of interview, income, education, and television (and about the same as radio and newspaper). 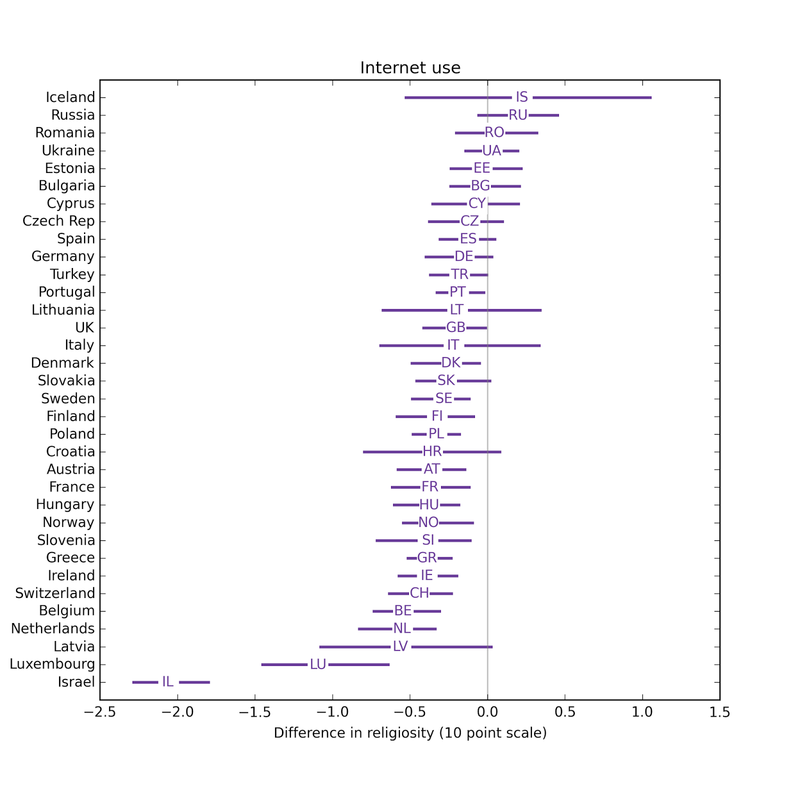 This asymmetry suggests that Internet use causes a decrease in religiosity, and the reverse effect (religiosity discouraging Internet use) is weaker or zero. It is still possible that a third factor could cause both effects, but the control variables in the model, and asymmetry of the effect, makes it hard to come up with plausible ideas for what the third factor could be. I am inclined to consider these results as evidence of causation (and not just a statistical association). Causality is almost wholly a factor of methodology, not statistics. Which variables are manipulated, which are measured, when they're measured/manipulated, in what order, and over what period of time are all methodological considerations. Not to mention control/confounding variables. Long story short: causality is a helluva lot harder than most people believe it to be, and that difficulty isn't circumvented by mere regression. I believe this is a consensus opinion among many statisticians and social scientists, but to be honest I find it puzzling. As I argued in this previous article, correlation is in fact evidence of causation, because observing a correlation is more likely if there is causation than if there isn't. The problem with correlation is not that it is powerless to demonstrate causation, but that a simple bivariate correlation between A and B can't distinguish between A causing B, B causing A, or a confounding variable, C, causing both A and B. If A (Internet use, in my example) actually causes B (decreased religiosity), but not the other way around, and we run regressions with B as a dependent variable, and A as an explanatory variable, we expect find that A predicts B, of course. But we also expect the observed effect to persist as we add control variables. The magnitude of the effect might get smaller, but if we can control effectively for all confounding variables, it should converge on the true causal effect size. On the other hand, if we run the regression the other way, using B to predict A, we expect to find that B predicts A, but as we add control variables, the effect should disappear, and if we control for all confounding variables, it should converge to zero. For example, in this previous article, I found that first babies are lighter than others, by about 3 ounces. However, the mothers of first babies tend to be younger, and babies of younger mothers tend to be lighter. When I control for mother's age, the apparent effect is smaller, less than an ounce, and no longer statistically significant. I conclude that mother's age explains the apparent difference between first babies and others, and that the causal effect of being a first baby is small or zero. I don't think that conclusion is controversial, but here's the catch: if you accept "the effect disappears when I add control variables" as evidence against causation, then you should also accept "the effect persists despite effective control for confounding variables" as evidence for causation. Of course the key word is "effective". If you think I have not actually controlled for an important confounding variable, you would be right to be skeptical of causation. If you think the controls are weak, you might accept the results as weak evidence of causation. But if you think the controls are effective, you should accept the results as strong evidence. So I don't understand the claim that regression models cannot provide any evidence for causation, at all, ever, which I believe is the position my correspondents took, and which seems to be taken as a truism among at least some statisticians and social scientists. [...]just because you have statistical evidence for a hypothesized relationship doesn't mean you have methodological evidence for it. Methods and stats go hand in hand; the data you gather and analyze via statistics are reflections of the methods used to gather those data. Say there is compelling evidence that A causes B. So I hypothesize that A causes B. I then conduct multiple, methodologically-rigorous studies over several years (probably over at least a decade). This effectively becomes my research program, hanging my hat on the idea that A causes B. I become an expert in A and B. After all that work, the studies support my hypothesis, and I then suggest that there is overwhelming evidence that A causes B. Now take your point. There could be nascent (yet compelling) research from other scientists, as well logical "common sense," suggesting that A causes B. So I hypothesize that A causes B. I then administer a cross-sectional survey that includes A, B, and other variables that may play a role in that relationship. The data come back, and huzzah! Significant regression model after controlling for potentially spurious/confounding variables! Conclusion: A causes B.
Nope. In your particular study, ruling out alternative hypotheses by controlling for other variables and finding that B doesn't predict A when those other variables are considered is not evidence of causality. Instead, what you found is support for the possibility that you're on the right track to finding causality. You found that A tentatively predicts B when controlling for XYZ, within L population based on M sample across N time. Just because you started with a causal hypothesis doesn't mean you conducted a study that can yield data to support that hypothesis. So when I say that non-experimental studies provide no evidence of causality, I mean that not enough methodological rigor has been used to suppose that your results are anything but a starting point. You're tiptoeing around causality, you're picking up traces of it, you see its shadow in the distance. But you're not seeing causality itself, you're seeing its influence on a relationship: a ripple far removed from the source. One point of disagreement seems to be the meaning of "evidence". I admit that I am using it in a Bayesian sense, but honestly, that's because I don't understand any alternatives. In particular, I don't understand the distinction between "statistical evidence" and "methodological evidence". Part of what my correspondent describes is a process of accumulating evidence, starting with initial findings that might not be compelling and ending (a decade later!) when the evidence is overwhelming. I mostly agree with this, but I think the process starts when the first study provides some evidence and continues as each additional study provides more. If the initial study provides no evidence at all, I don't know how this process gets off the ground. But maybe I am still stuck on the meaning of "evidence". A key feature of this position is the need for methodological rigor, which sounds good, but I am not sure what it means. Apparently regression models with observational data lack it. I suspect that randomized controlled trials have it. But I'm not sure what's in the middle. Or, to be more honest, I know what is considered to be in the middle, but I'm not sure I agree. To pursue the third point, I am exploring methods commonly used in the social sciences to test causality. To estimate the effect of a particular treatment, D, on a particular outcome, Y, we divide an observed sample into a treatment group that received D and a control group that didn't. For each member of the treatment group, we identify a member of the control group that is as similar as possible (I'll explain how soon), and compute the difference in Y between the matched pair. Averaging the observed differences over the pairs yields an estimate of the mean causal effect of D on Y. The hard part of this process is matching. Ideally the matching process should take into account all factors that cause Y. If the pairs are identical in all of these factors, and differ only in D, any average difference in Y must be caused by D.
Of course, in practice we can't identify all factors that cause Y. And even if we could, we might not be able to observe them all. And even if we could, we might not be able to find a perfect match for each member of the treatment group. Identify factors that predict D. In my example, D is Internet use. Build a model that uses those factors to predict the probability of D for each member of the sample; this probability is the propensity score. In my example, I use logistic regression with age, income, education, and other factors to compute propensity scores. Match each member of the treatment group with the member in the control group with the closest propensity score. In my example, the members of each pair have the same predicted probability of using the Internet (according to the model in step 2), so the only relevant difference between them is that one did and one didn't. Any difference in the outcome, religiosity, should reflect the causal effect of the treatment, Internet use. I implemented this method (details below) and applied it to the data from the European Social Survey (ESS). In each country I divide respondents into a treatment group with Internet use above the median and a control group below the median. 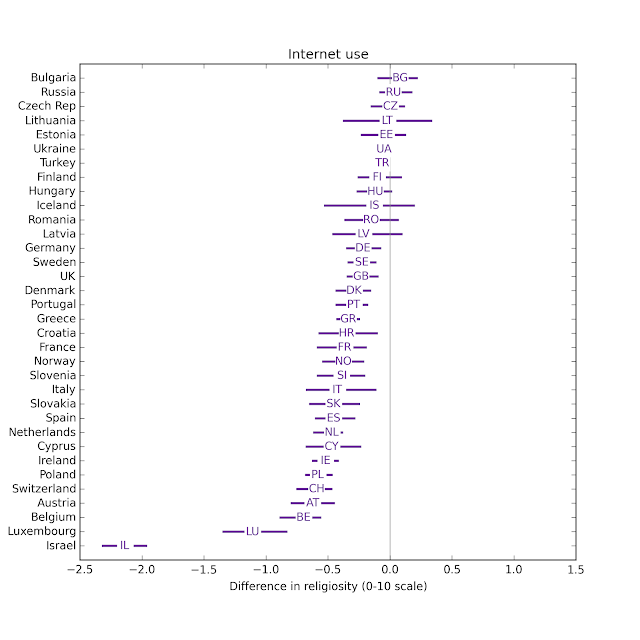 We lose information by quantizing Internet use in this way, but the distribution tends to be bimodal, with many people at the extremes and few in the middle, so treating Internet use as a binary variable is not completely terrible. To compute propensity scores, I use logistic regression to predict Internet use based on year of birth (including a quadratic term), year of interview, education and income (as in-country ranks), and use of other media (television, radio, and newspaper). As expected, the average propensity in the treatment group is higher than in the control group. But some members of the control group are matched more often than others (and some not at all). After matching, the two groups have the same average propensity. Finally, I compute the pair-wise difference in religiosity and the average across pairs. The estimated effect of Internet use on religiosity is negative in 30 out of 34 countries; in 18 of them it is statistically significant. In 4 countries the estimate is positive, but none of them are statistically significant. The confidence intervals for the matching estimator are bigger. Some part of this difference is because of the information we lose by quantizing Internet use. Some part is because we lose some samples during the matching process. And some part is due to the non-parametric nature of matching estimators, which make fewer assumptions about the structure of the effect. The details of the method are in this IPython notebook, but I'll present the kernel of the algorithm here. In the following, group is a Pandas DataFrame for one country, with one row for each respondent. That's all there is to it. There are better ways to do the matching, but I started with something simple and computationally efficient (it's n log n, where n is the size of the control or treatment group, whichever is larger). The agreement of the two methods provides some evidence of causation, because if the effect were spurious, I would expect different methodologies, which are more or less robust against the spurious effect, to yield different results. But it is not very strong evidence, because the two methods are based on many of the same assumptions. In particular, the matching estimator is only as good as the propensity model, and in this case the propensity model includes the same factors as the regression model. If those factors effectively control for confounding variables, both methods should work. If they don't, neither will. The propensity model uses logistic regression, so it is based on the usual assumptions about linearity and the distribution of errors. But the matching estimator is non-parametric, so it depends on fewer assumptions about the effect itself. It seems to me that being non-parametric is a potential advantage of matching estimators, but it doesn't help with the fundamental problem, which is that we don't know if we have effectively controlled for all confounding variables. So I am left wondering why a matching estimator should be considered suitable for causal inference if a regression model is not. In practice one of them might do a better job than the other, but I don't see any difference, in principle, in their ability to provide evidence for causation: either both can, or neither.